Last weekend, we had a little Christmas lunch at my folks' place. (If you follow me on Instagram, you'll know that I also did a BIG turkey lunch there a couple of weeks before, which I definitely plan on blogging soon!) This lunch was a bit smaller, just the four of us, but no less festive! I tried to go for a menu that was still special, but not as belt-poppingly decadent as a full turkey lunch. 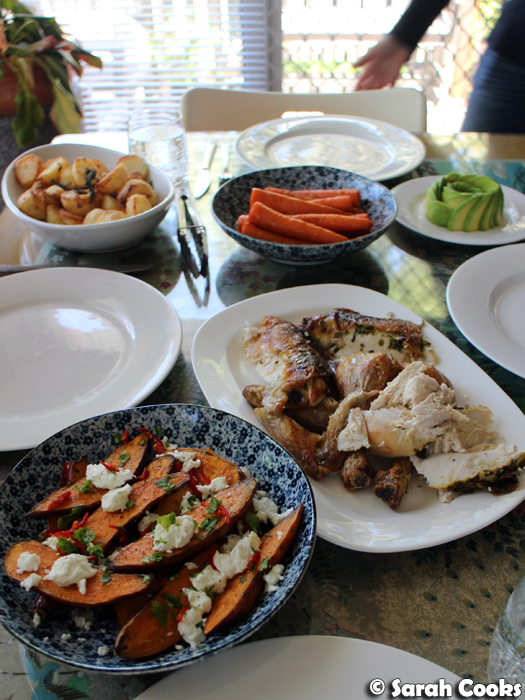 A roast chicken was the centrepiece, accompanied by some delicious vegetable sides, followed by a buttery almond cake. Ta-dah! 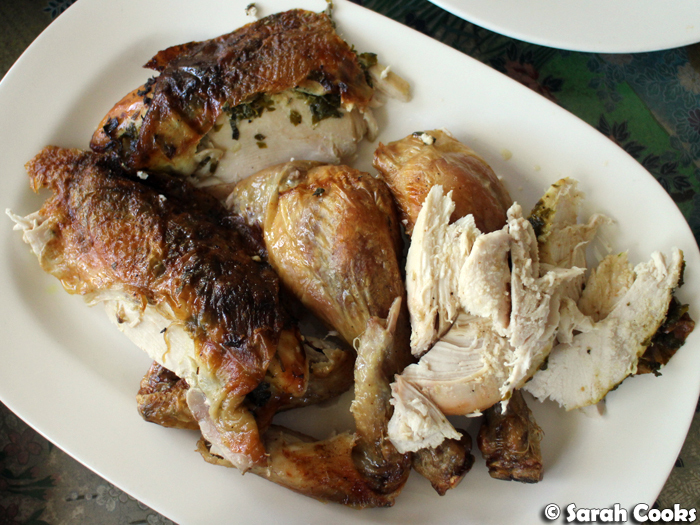 For the chicken, I splashed out on a fancy Organic Milawa chicken, and roasted it simply. I mixed up some butter, chopped sage, parsley, lemon zest, salt and pepper, and spread this mixture under the skin to keep the breast moist. 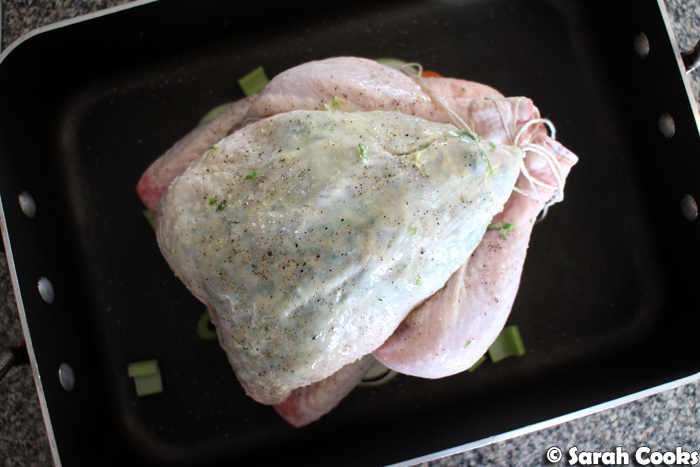 Half a lemon and a garlic clove went into the cavity, and then I trussed the chicken to keep it looking nice. 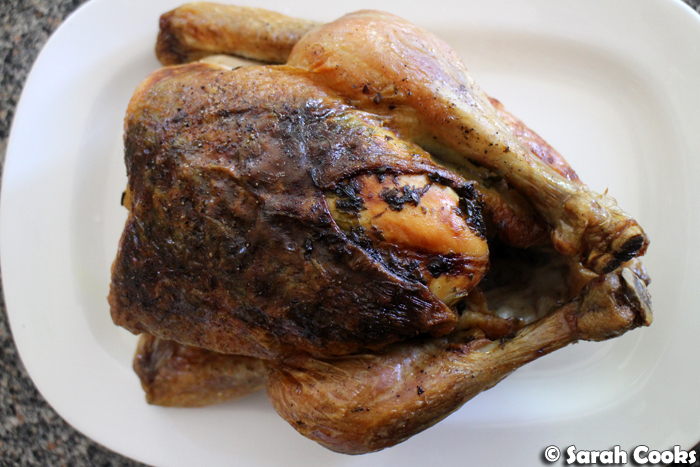 (Check out my guide on "How to Truss a Chicken" for more details!) 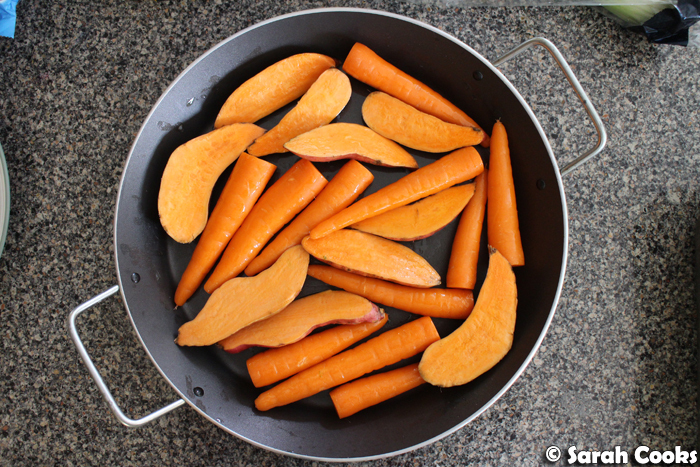 Then it went into a roasting tray, atop a trivet of chopped onion, celery and carrots. I seasoned it generously with salt and pepper, and drizzled it with olive oil, and then it went into the oven at 200C for 20 minutes per 500 grams plus 30 minutes. Done! After the chicken came out and was resting, carefully covered in a foil blanket, I roasted the potatoes on the top shelf, with the the carrots and sweet potatoes in a tray underneath. (These were just roasted in a little olive oil, with the seasonings and flavourings added separately afterwards). Whoops, the skin split a little in the oven but it was all good - luckily the chicken didn't dry out! In fact, it was super succulent and juicy, with nice crisp skin. Hooray! Here are the sides! 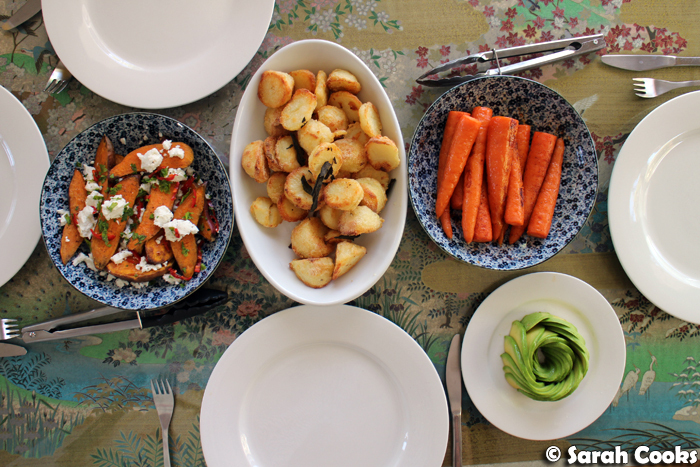 The sweet potatoes were to keep my mum happy, the carrots were to keep Sandra happy, and the roast potatoes were absolutely non negotiable for everyone at the table! (The avocado rose was because our latest delivery from Barham avocados has been ripening faster than we can cope with in this heat! My mum was very impressed with my avocado-presentation skills, heh). 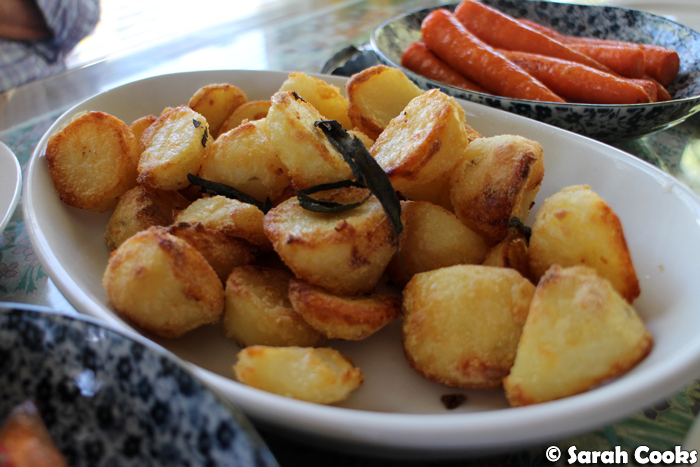 The potatoes were Nigella's perfect roast potatoes, with a few sage leaves added for the last 10 minutes of cooking. Best. 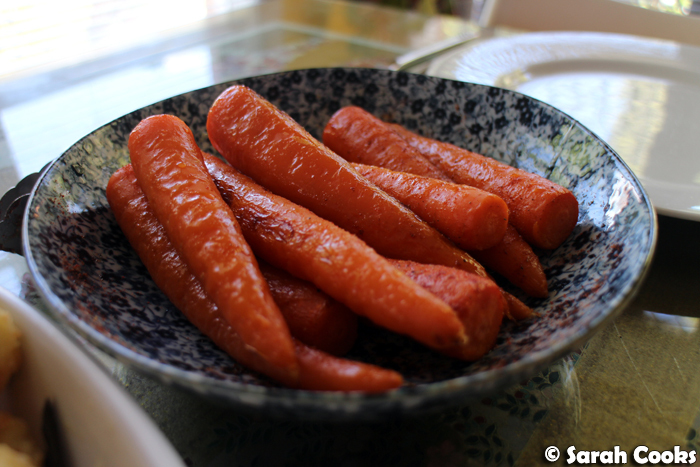 Sandra did the carrots - seasoning them with salt, pepper and cayenne pepper, and drizzled with a little honey. Lovely! The sweet potatoes were a bit of an impromptu dish - we'd picked up some cute small sweet potatoes the day before, with no idea of what to do with them. On the day, while I was cooking, I thought some chilli and goats cheese would go well. (My dad and Sandra kindly went to the supermarket to pick up both ingredients!) 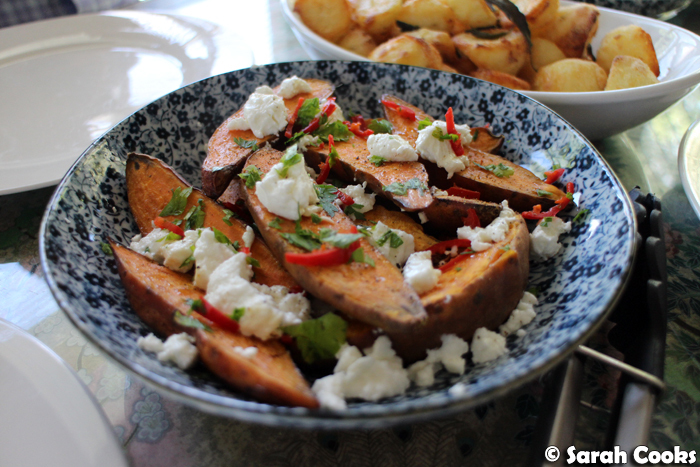 Once the sweet potatoes came out of the oven, I sprinkled them with cumin, salt and pepper, and arranged them in a bowl with goats cheese, chopped chilli and parsley. How festive with the red and green flecks! I was surprised by just how good this tasted - my sweet-potato-obsessed mother couldn't stop eating these! Def making these again! So, after cleaning up, we put some tea on and got stuck into dessert! 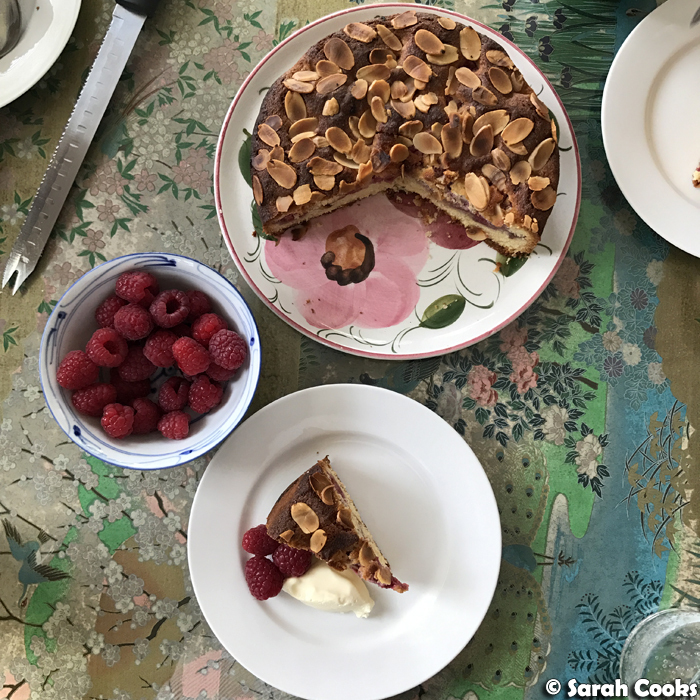 I'd baked a raspberry Bakewell cake - a buttery almond cake, with a layer of raspberry jam and fresh raspberries in the middle. I'd actually thought of making a trifle or a Bakewell tart, but I was too lazy to do either. The cake was much lower effort, but was so good! 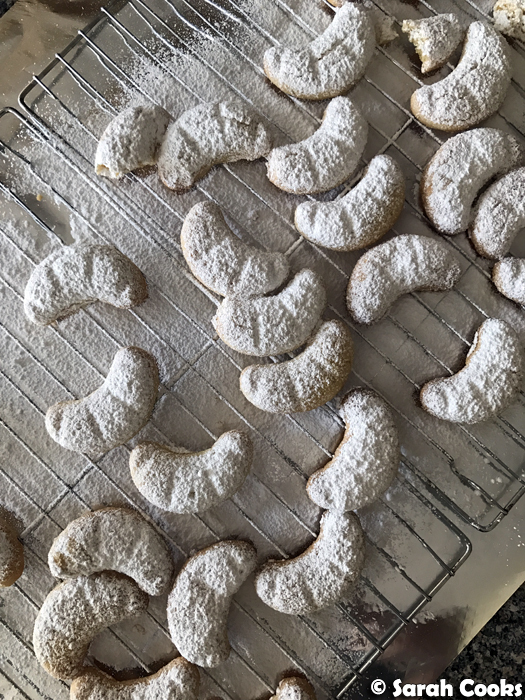 I'll be sharing the recipe soon. This was served with fresh raspberries and double cream - ridiculous. It was such a wonderful lunch! It was actually kinda a last-minute idea to do a small Christmas lunch, and I'm so glad we did. It was great to have a nice afternoon with my parents, enjoying good food and even better company. Yay! And while we're here, I just wanted to quickly show you some gifts that we've been distributing to friends and colleagues in the week leading up to Christmas. 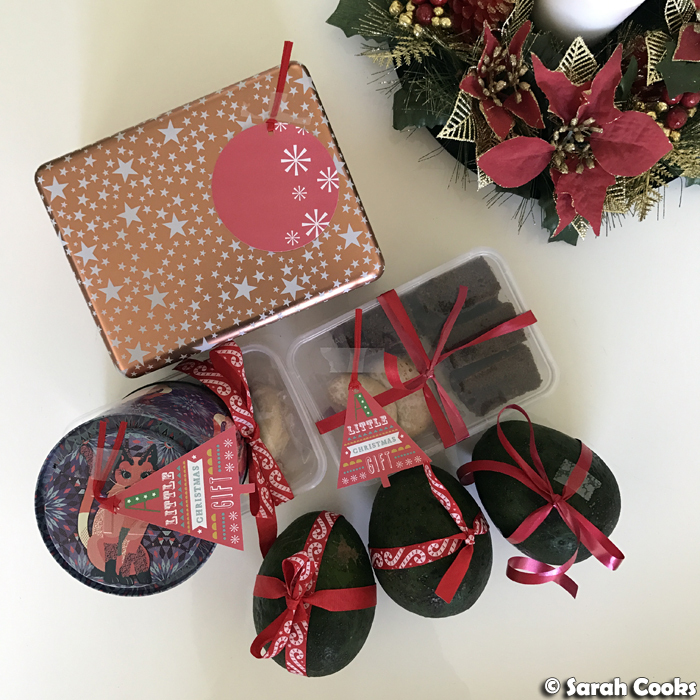 These include those Vanillekifperl you saw earlier in this post, but also the coffee stout gingerbread, the raspberry bakewell cake, and yes, some avocados.